When you would like to create something that celebrates Halloween in a simple and fun way, and you would like for that something that you create to be a gift card, you will find that this Halloween gift card template will help you out. With the help of this template, you can create something that makes for a great Halloween themed gift. This template offers you all of the help that you need to create something that is special and that will be noticed. This template features an image of bat wings and a Halloween message, and it is perfect for all ages. This template includes space for the name of the one who is going to be receiving it as well as space for the name of the one who is giving it. 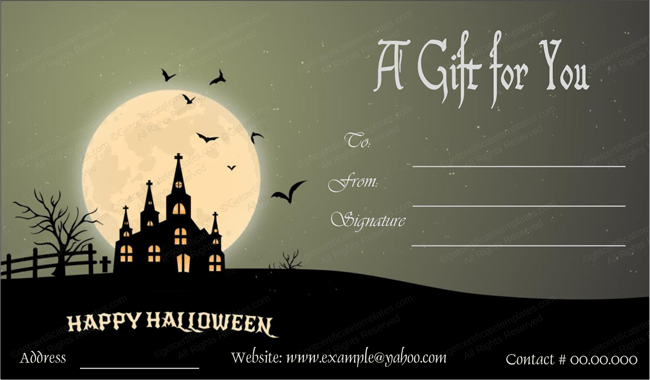 Celebrate Halloween in a new and special way through the help that is found in this Halloween gift card template.